The controversy over nicotine vaping never seems to end. There are new claims of studies showing risks every week, and the issue is a hot-button topic all over the world. But vaping isn’t just for nicotine, and yet, marijuana vaping doesn’t seem to be placed under the same level of scrutiny. There aren’t as many groups rushing to conduct studies and ultimately, information on the risks of vaping cannabis and the relative risk compared to smoking it is quite hard to come by. However, if you’re considering switching to vaping marijuana instead of smoking it, finding out about the potential risks and benefits is crucial. Is vaping weed safer than smoking it? Is it safe altogether? We’ve looked through the evidence to give you the answers you’re looking for. In theory, marijuana vaping should be safer than smoking, because – as with nicotine vaping – it’s designed to deliver the THC (the main psychoactive component of the cannabis plant) without combustion, and most of the dangerous chemicals ultimately stem from combustion. So if you’re not burning the marijuana, the vapor you inhale should contain much fewer toxins than the smoke from a joint would. As with nicotine vaping, this isn’t hard evidence and you do need experimental confirmation to back this assumption up. And from there, ideally there would be some further indication that this reduced exposure to harmful chemicals resulted in fewer health issues as a result. However, it’s important to remember this and not lose sight of the pretty solid rationale behind vaping instead of smoking to reduce health risks. For nicotine vaping vs. tobacco smoking, the difference in risk is substantial because smoking tobacco is so dangerous. Even if you were setting out to purposefully create a new habit that’s as risky as smoking, you would struggle to achieve your goal. For marijuana, things are a little different. While smoking it will affect your respiratory system, the evidence when it comes to specific serious consequences like emphysema or lung cancer is inconsistent at best. For example, many studies find no link between cannabis use and the development of lung cancer – after, crucially, controlling for tobacco smoking – but it is consistently linked to many changes seen as precursors to lung cancer, and other studies do find a link, albeit a smaller one than from smoking cigarettes. The bottom line is that if you’re a light to moderate cannabis smoker, your risks probably aren’t as big as a cigarette smokers’. However, there is still definitely a risk, and more research will make the extent of it easier to determine. For the risks of vaping marijuana, this basically means that the potential for benefit is notably smaller than for vaping nicotine-containing e-juice, but it’s clear there is still quite a lot of potential for benefit. However, this potential benefit is much bigger if you’re a heavy smoker or mix your marijuana with tobacco. The easiest way to test the overall theory behind vaping marijuana is to test the chemicals given off by a vaporizer. If it’s true that combustion doesn’t occur and this makes it safer to vape, you’d see a reduction in the amount of harmful chemicals given off, compared to the smoke from a joint. An early model of vaporizer called the Tilt was released in the 80s, and it was also the subject of one of the first tests of the overall theory. The device was tested at 185 to 195 °C and the emissions were compared with those from a similar sample smoked from a clay pipe. The results showed a 79 percent reduction in tar, no detectable carbon monoxide, an 80 percent increase in THC and a 60 percent increase in CBD. Overall, the ratio of THC to tar was increased by eight and a half times, showing that you get much more of what you’re looking for with a drastic reduction in harmful components. Other early studies were similarly positive but limited by the poor design of vaporizers at the time. A test of the Volcano from 2003 showed similarly positive results, and was more specific in its search for toxic components than just saying “tar.” The testing showed that the vapor produced by the Volcano was 95 percent pure THC, with one suspected cannibinoid, an oil deriving from the cannabis plant and one polycyclic aromatic hydrocarbon (a PAH – a family of toxic chemicals) making up the rest of the mixture. Comparatively, the smoke contained half a dozen known PAHs and over 111 components altogether. In total, non cannabinoid ingredients composed 88 percent of the smoke. Another study from 2007 was mainly concerned with looking at THC concentrations in user’s blood after vaping, but also measured the amount of carbon monoxide in their breath compared to after smoking a joint. This showed a reduction in exhaled carbon monoxide after vaping compared to smoking, which is an especially important result because this is one of the most damaging chemicals found in smoke. Overall, there aren’t many studies that look at other chemicals in the vapor produced by marijuana vaporizers. However, the ones that do exist show the expected reduction in the harmful chemicals that come from combustion when you vape cannabis instead. There are a few studies worth mentioning that depend on self-reporting from users. The first two are quite simple and basically show that users perceive a health benefit from vaping marijuana as opposed to smoking it. These studies are both fairly recent – one from 2014 and one from this year – but users in both of them identified harm reduction as a key reason for vaping marijuana rather than smoking it. As well as believing it to be lower in risk, they also argued that vaping is more efficient than smoking, which is a point backed up by other research too. The more interesting self report study came out in 2007, and recruited just under 6,900 participants to answer questions about symptoms such as coughing, wheezing, shortness of breath and other respiratory symptoms. The results showed that people who vaporize cannabis are 60 percent less likely to report respiratory symptoms compared to people who people who use cannabis in other ways. The study also found that if you vape more, you’re more likely to experience more symptoms, however, still less overall than people who consume cannabis in another way. There isn’t too much evidence from these self report studies either, but again they paint a positive picture overall. Lung function is tested using spirometry, and this can give an insight into the benefits of vaping. 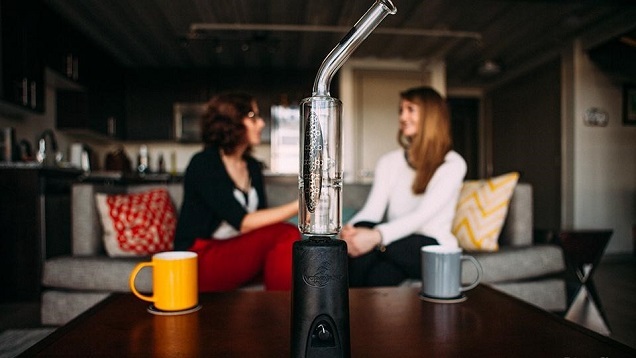 Lab-based studies of people using vaporizers are the best way to look at the precise effects vaping has on users, and there are a few such studies that can be drawn on to answer the question: is vaping marijuana safe? One of these studies, mentioned earlier, showed a reduction in the carbon monoxide exhaled after vaping vs. smoking, but there are a couple of others that it’s worth covering. A 2010 study recruited 20 regular cannabis users and instructed them to use a vaporizer for a month following the start of the study. Their lung function was checked before and after using spirometry testing (which looks at things like the amount of air you can exhale in one second or the total capacity of your lungs) and a questionnaire looking at nine different respiratory symptoms and rating their severity. The results showed that – for the 12 participants not diagnosed with a respiratory illness during the month trial – their respiratory symptoms and their maximum lung capacity improved. There was also an improvement in the amount they could exhale in one second but the difference from the start of the study wasn’t statistically significant. Overall the study showed potential benefits for cannabis smokers switching to vaping, but it was ultimately a small pilot study, and the researchers recommended a bigger, more rigorous follow-up. Another study, published in 2017 recruited frequent and occasional cannabis users and looked at the subjective effects experienced and some physical effects after they either smoked cannabis, vaped it, consumed it in edible form or had a placebo. The results showed that subjective effects were greater than after placebo after smoking and vaping, but only occasional users showed a difference after the oral dose. Heart rate increased by 12.2 beats per minute half an hour after smoking, and 10.7 bpm half an hour after vaping. An hour and a half after the dose, people who ate the cannabis saw a 13 bpm increase in heart rate, which dropped to 10.2 bpm after three hours. Only those who smoked the cannabis had increases in the amount of carbon monoxide exhaled, which continued up to 6 hours after smoking, compared to the vapers, who showed no such increase. Yet again, the evidence is admittedly limited but ultimately points to vaping as a way to reduce harm compared to smoking cannabis. The research presented so far specifically addresses vaporizing cannabis plant material, but many vapers use oils and concentrates in devices more like traditional vape pens. These are still likely to be safer than smoking cannabis because they still avoid combustion and the slew of toxic chemicals that come with it. However, there are some additional concerns about vaping oils and concentrates that are worth a mention. Firstly – and less importantly – there has been a version of the formaldehyde panic for cannabis concentrate vaping, stemming from this study. The research involved heating propylene glycol (PG), vegetable glycerin (VG), polyethylene glycol (PEG) and medium chain triglycerides (MCT) to 230 °C and testing the vapor produced for formaldehyde, acetaldehyde and acrolein. The results essentially showed formaldehyde and acetaldehyde levels increased in the PG and PEG (more so in the PEG), with less concerning results for VG and MCT. While this could theoretically be a concern, it’s important to note that devices for oils are substantially different to those for dry herb, and work more like a traditional e-cigarette. They aren’t heated to 230 °C specifically, because they tend to work on the basis of voltage. For traditional vaping devices, the point of high formaldehyde levels comes with an awful taste and a burning sensation on inhalation. It could well be that these levels occur in ordinary use for vaping weed oils and aren’t as detectable, but this would need to be confirmed with further research in more realistic usage conditions. There are other reasons to be concerned about vaping concentrates, though. For one, many companies used to use butane to extract the THC, and residual butane would make it into the oil. While many companies now use cleaner, safer CO2 based extraction, this is something to keep an eye out for. Pesticides are another issue. One investigation found that 41 out of 44 commercially-sold samples of marijuana had detectable (and often high) levels of pesticides in them. This is an issue anyway, but with concentrated oils and waxes, you’re also getting a concentrated amount of pesticides, making it even more of a concern in these cases. While buying from a trusted supplier can help reduce the risk of this, it is by no means a guarantee. There are other potential issues too, like the potential for cuticle waxes (which is a layer of fats found on the outside of most plants) making its way into the oil. These are burned off by smoking but not if you vape. Some companies use a process called winterization to remove this from their extracts (and admittedly this risk is more theoretical at the moment), so it can be avoided if you’re careful. The short version is that concentrates seem to carry greater risks than cannabis plant material, but again it’s important to note that it’s still likely to be safer than smoking. The Bottom Line: Is Vaping Cannabis Safe? Is it Safer Than Smoking? Overall, the evidence on cannabis vaping is limited but appears to paint a consistent picture: vaping rather than smoking reduces your exposure to toxic chemicals and likely does much less damage to your body. The benefit of vaping cannabis vs. smoking it is likely to be smaller than the benefit of vaping nicotine vs. smoking cigarettes, but this is more because smoking cannabis appears to be less dangerous than smoking tobacco on the whole. It should go without saying that vaping marijuana isn’t safe in an absolute sense. But a lot of things aren’t safe, especially when you’re talking about enjoyable vices. Of course, edibles are highly likely to be safer than vaping because it doesn’t involve your lungs, but it’s hard to get a good dose from eating cannabis and there’s quite a lag between consuming it and feeling the effects. [V]apourizers show promise for cannabis users who want to avoid pulmonary problems and prefer a more rapid onset than edibles provide. While vaping cannabis reduces respiratory exposure to toxic particulates in cannabis smoke, the resultant reduction in clinically evident harms to lung health is probably smaller than that likely to result from substituting e‐cigarettes for smoked tobacco due to the comparatively greater harms of tobacco than cannabis smoking to lung health. So that’s the state of the evidence at the minute: there is limited data, but everything suggests that you’re much less likely to have health problems if you vape your marijuana instead of smoke it.